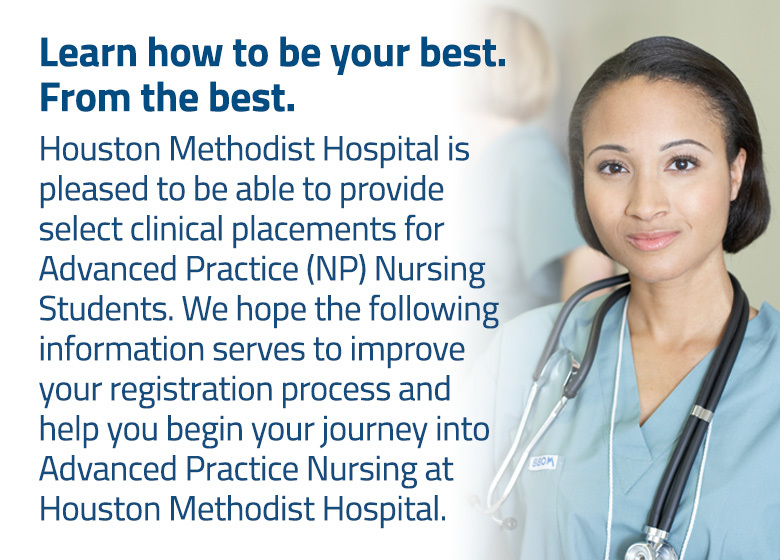 The Student Nurse Practitioner Program is available only at Houston Methodist Hospital. Application deadlines are listed below. Any requests made outside of this process and/or beyond the deadline will not be considered. The student will be contacted via email by the preceptor committee upon receipt of the application. Before each clinical semester begins, it is required that all Nurse Practitioner students attend a student hospital orientation. Please note that students cannot begin their clinical assignment until orientation is completed and the student has received a Houston Methodist badge. The hospital orientation class will be scheduled at the beginning of each semester. Students who have been accepted will be notified of the time, date and location. Please note that it is the responsibility of the School of Nursing to ensure that the students and faculty attending clinical at Houston Methodist Hospital are current with the required documentation. Failure to do so may result in a delay of the clinical experience. A minimum of one week prior to the first clinical day a complete list of students attending the clinical should be sent to ahernandez@tmhs.org. Please be sure to include the students' middle initial. The list of names along with the school they are attending will be sent to our Information Technology Department so that user IDs and passwords can be created. Computer-based CD ROMs for computer training should be picked up one week prior to the first clinical day and distributed to the students. The students should complete the training exercise along with the practice test at the end prior to hospital orientation. At orientation the students should return the CD ROMs issued to them, at which time they will receive their login IDs and passwords for computer access. Students who do not return the CD ROM will not receive computer access until the CD is returned. Please note that the CD ROM only provides training on the general navigation of the system. On the day of Hospital Orientation for the clinical group, the students will be escorted to the Badge and Transportation Office to have their picture taken and receive their Houston Methodist student badge. A badge must be worn at all times while on duty or on the campus of Houston Methodist Hospital. Please note: Student information turned in after the deadline will result in a delay of the clinical rotation. To learn more, fill out our online form.